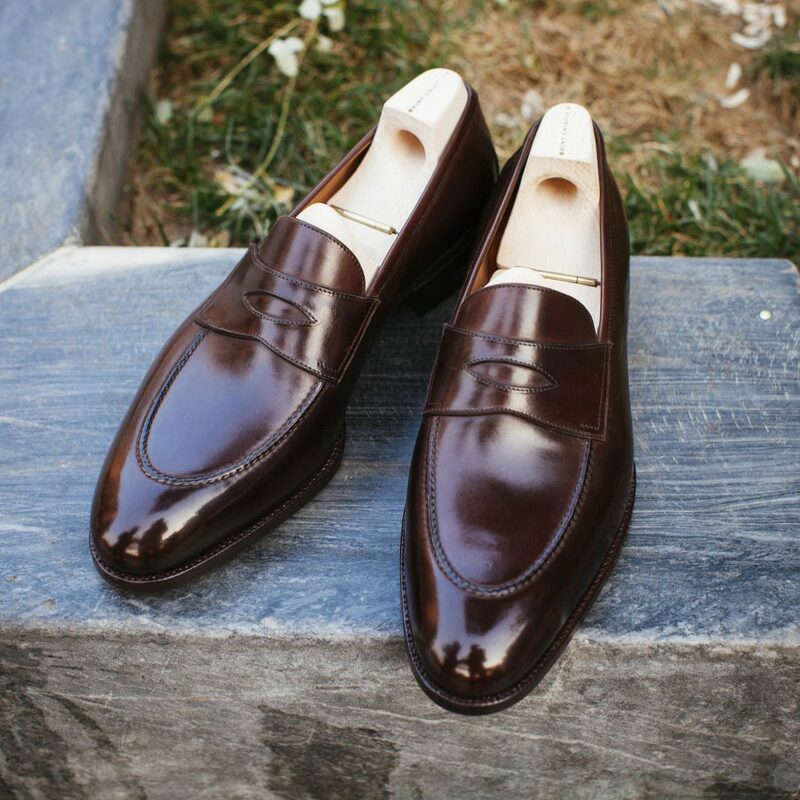 At Medallion, we have introduced the well-known shoemaker Saint Crispin’s based in Vienna, Austria. In June 2018, we had the pleasure to receive our friend Philip Car, with whom we hosted two successful Trunk shows in first Beijing and then Shanghai. During this exclusive Trunk-Show, Made-To-Order service was offered at the same retail price as Ready to Wear pairs. 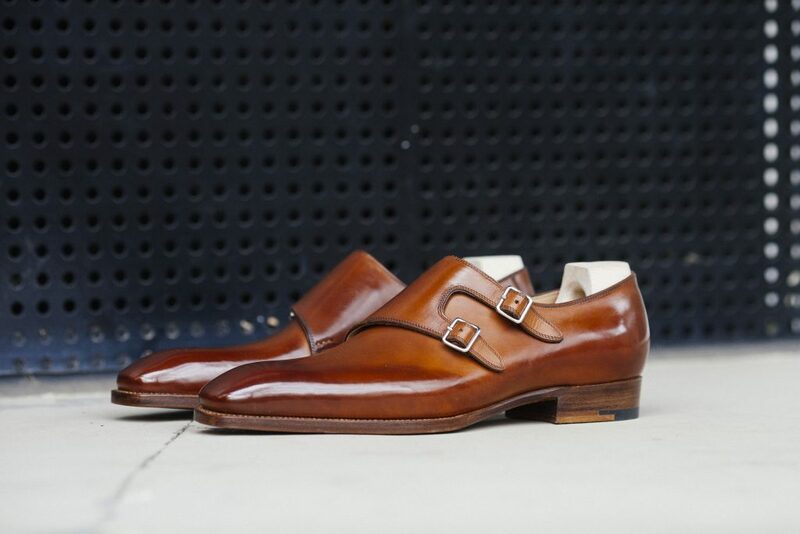 A Made to Order pair from Saint Crispin’s is certainly the best solution for anyone seeking after a hand-made unique piece of footwear at a sweet price when compared to bespoke. 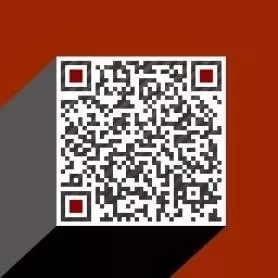 Mr. Phillip Car, who has been successfully managing Saint Crispin’s for years now, and who has built a tremendous experience regarding footwear manufacturing, has been of a great help sharing inspirations and advices to our dear customers, based on their looks, lifestyle and feet’s anatomy. 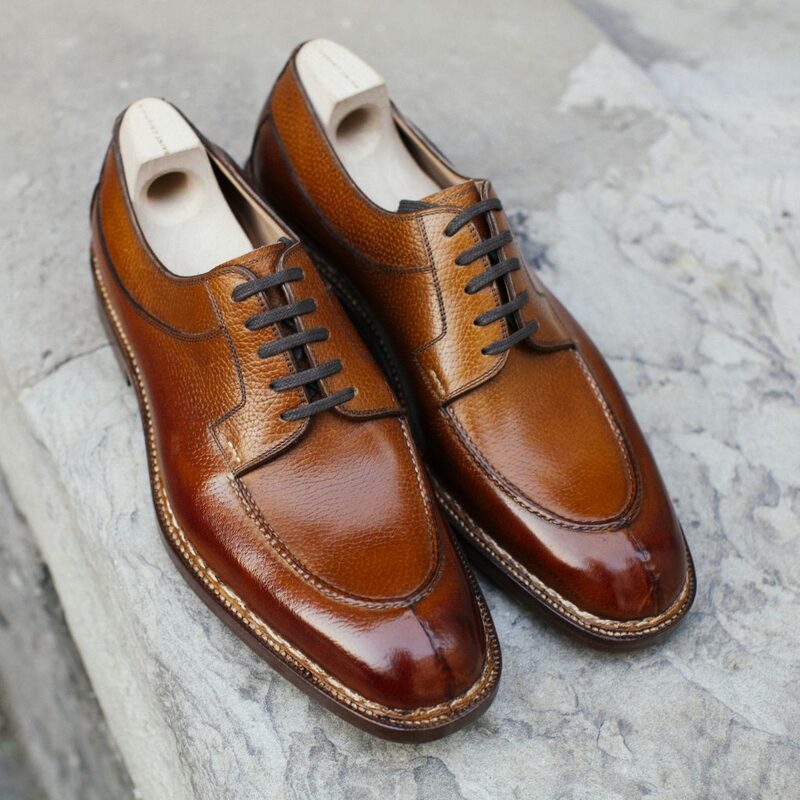 If you do seek for Saint Crispin’s hand-made Made-to Order shoes, but unfortunately missed the opportunity to be present during Saint Crispin’s Trunk Show, don’t worry our trained team will be able to advise you as regards of design for your pair of Saint Crispin’s MTO. Medallion currently stocks more than 150 pairs of Ready to wear pairs from Saint Crispin’s, that are perfect for you to try the different models, assess the quality and feel the leather. Medallion offers a selection of more than 23 models, in a variety of styles, Patina, leathers and lasts. Many model are unique in style and Special-Made for Medallion only. We have sorted out a selection of 6 models that we believe are the essence of Saint Crispin’s footwear. The model is a classic Full–Brogue Oxford, with Saint Crispin’s emblematic medallion on Toe. This medallion is inspired from an old medallion found on an ancient Austrian pair of shoes. 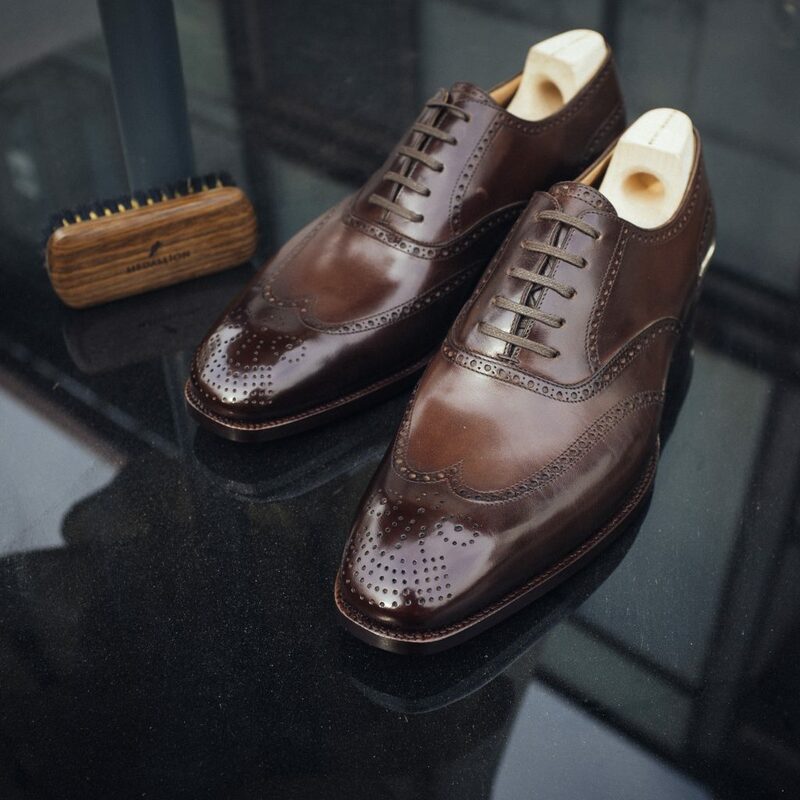 Although this Full Brogue features perforations on the upper, nevertheless the model remains very sleek in look. The special features of Saint Crispin’s shoemaking are reflected in the details of various aspects, such as last design, carving design, etc. The Chiselled last, is one of Saint Crispin’s classic last. The last Toe is chiselled and squared, with a narrowed waist that offers a great comfort thanks to the great arch support. The last is curved on the outside and feels just roomy enough for any feet. As you may have heard, monk shoes were originally worn by European monks, as it was a simple shoe. The model is not only simple in look without any embellishment, but also simple to slip on and take off. The model evolved and a second strap was added to the model during the first part of the twentieth century. The Double Monk we offer is very elegant thanks to its buckles positioned outwards combined with the plain front vamp, and the slender Novello Last on which the model has been pulled on . 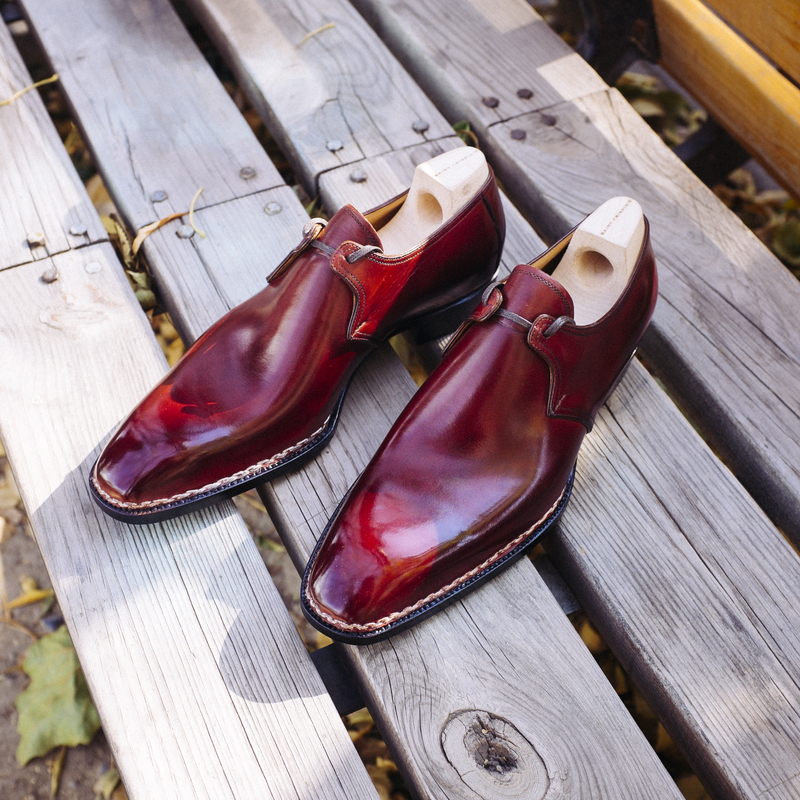 The third model we selected for you is an Apron Penny Loafer to be worn when you would need something more casual. As you know a Loafer shoe is a more casual model when compared with Oxford or even Monks, and we do love it as it feels incredibly comfortable to wear. This Penny loafer has been made special, thanks to the Apron hand-sewn vamp. The decorative, thicker than usual hand-stitch Apron gives a rougher aspect to the model. This added texture brings a unique look to this loafer. 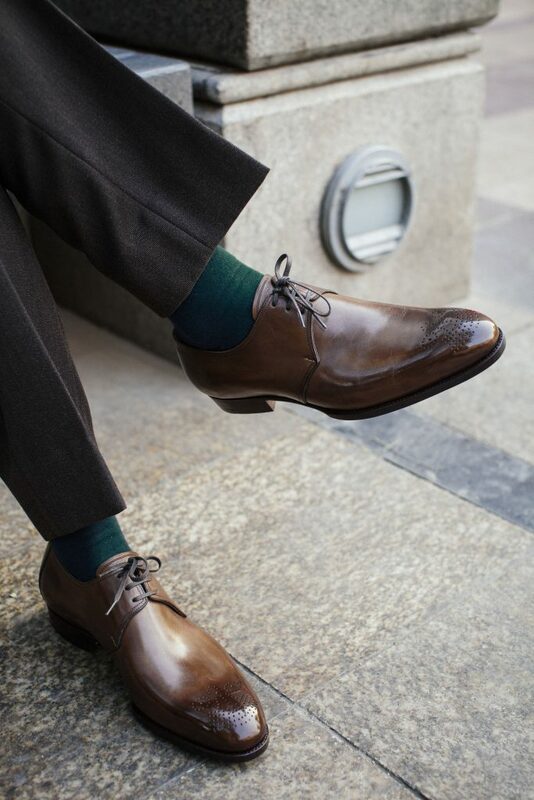 The Derby shoe is certainly an other perfect shoe to wear with a casual outfit. Less formal than an Oxford shoe, the quarters are stitched above the vamp while at the same level on an Oxford shoe. When doing sport, one’s feet blood pressure increase, and thus the feet volume expand. However thanks to its difference in construction, Derby shoe would feel more comfortable and has been the model of choice to match with sport jackets and casual pairs of pants. 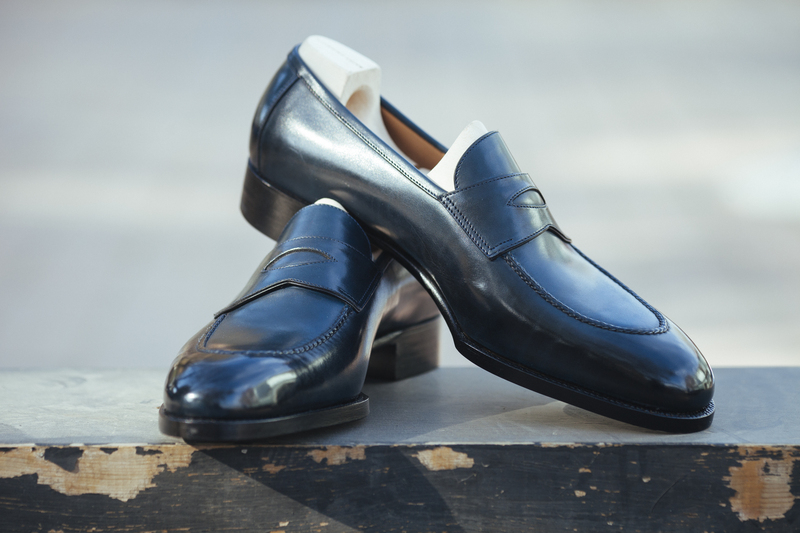 The last on this special Saint Crispin’s Derby shoe is named Sailor. It features a wide square Toe that works perfectly for more casual models. The Grain Calf leather emphasise the rustic look of this model. The spirit of sailing can be found on this last; Willing to explore the world and brave the danger. The wider square Toe, this pair feels roomy and comfy, the pair is completely Norwegian Welted, this construction will ensure the pair to be water-resistant. The Norwegian stitching requires the exquisite skills of a seasoned shoemaker. Developed in the cold rural mountainous area of western Europe, this stitching is made more resistant thanks to its triple stitching. 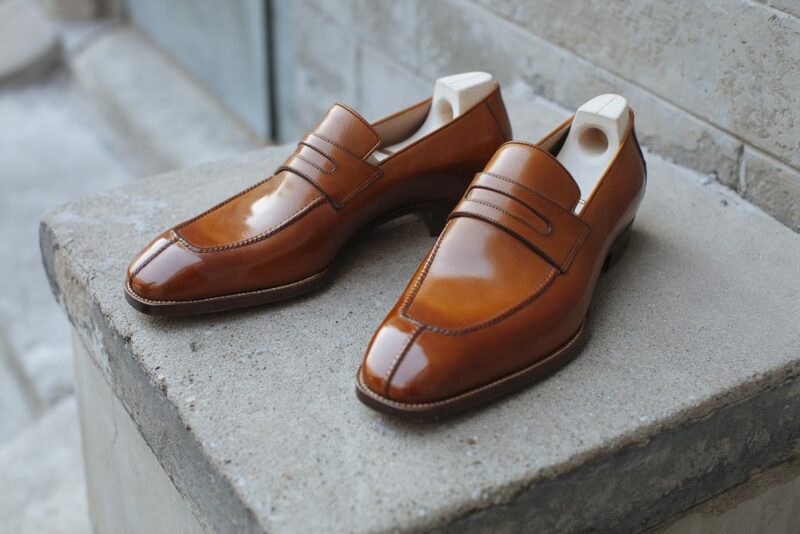 The fifth pair we selected for our customer is the Classic 539 Loafer. This dark brown Penny Loafer has become one of the most iconic design from Saint Crispin’s. Simple and elegant hand stitched Apron on vamp, the pair is pulled out on Saint Crispin’s Classic Last. The Crust leather of these pairs are hand-stained in a classic Dark Brown. Although the model is made on the classic last, that was certainly a last first made for Oxford and Derby, the result is marvellous as the pair looks incredibly balanced. This model can be worn equally good with suits as with more casual look like jeans. The sixth style, we offer is another classic from Saint Crispin’s collection, the 3 Eyelets Derby. The three eyelets Derby model is one of Saint Crispin’s signature model. With its concave quarters and plain upper, this pair of derby is a very refined and elegant model that will match wonderfully with your casual but elegant dress such as jeans, Chinos, and flannels pants. With only 3-eyelets instead of the more traditional 5 eyelets and rather small quarters emphasise the sleekness of the front of the Vamp.